James Read Clear Bronzing Spray, £24.50 - I first heard about the James Read tan on his interview with Pixiwoo on BodyTalk Daily. I was really intrigued by the bronzing spray because it doesn't require any buffing in, just spray on and go! It is very pricey so I was a bit wary about trying it but thought I'd give it a go. I was not disappointed! I absolutely loved this tan, I sprayed two light, even layers on and woke up to a natural golden glow. As it's a clear spray, it's not the best for tanning novices but it didn't leave any fake tan marks on my sheets so it was definitely worth the hefty price tag! However, my only gripe with this is that I only bought this at the beginning of the month and it's already run out. I don't tan every day, maybe 2 times a week and it ran out within 3 weeks. I was going to do a full review but it ran out before I could get round to it! Therefore, I will not be repurchasing this as value for money really isn't that great! Such a shame as I loved the finish and the ease of the product. Simple Hydrating Light Moisturiser, £3.79 - My go-to budget moisturiser, as many of you will know if you've read my empties post before! I go through a bottle of this every month or so, I wish they did a bigger bottle! My skin's had a bit of a hissy fit this month and this has really helped to calm it down and I really can't say a bad word about this. To increase moisture levels, I just add 3 drops of Rosehip Oil into this in the evening. L'Oreal Micellar Water, £3.33 - This is by far my favourite makeup remover! For £3.33 I will definitely continue repurchasing this. It removes all my makeup really easily, even fairly heavy eye makeup (although I do prefer to remove that with eye makeup remover). Cuticura Hand Gel (Passion Fruit & Mango) - For some reason I can't find this online but it's pretty easy to find in store! Not the most interesting of products but I always have to carry round antibacterial hand gel as I'm a bit of a hygiene freak! My favourite is the Soap and Glory one but this one does the job well although it's not the nicest scent. La Roche Posay Thermal Spring Water, £7.50 - Ah the infamous 'thermal water'. I have to say I'm still not 100% sure what exactly this does for the £7.50 price tag but it does feel really refreshing on the skin after cleansing and before moisturiser. I think this is probably more of a summer product as it's essentially a cooling spray so I'm not planning on repurchasing this for autumn/winter. L'Oreal Absolute Makeup Remover, £3.33 - Another product from the revamped L'Oreal skincare line, the Absolute Makeup Remover. This is one of the bi-phase oil/water makeup removers and I have to say I don't really see the hype. I haven't tried the Clarins one however so I may have to try that before I write them off altogether. E45 Moisturising Lotion, £4.85 - I've never actually tried the E45 lotion before and I thought it was about time I gave it a go. I got the 200ml bottle which ran out fairly quickly again so I think I'd rather stick with my thicker body butters, especially for autumn/winter. However, I did really like the lightweight feel of this and it sunk into my skin really quickly so a good option for anyone who hates waiting around for moisturiser to sink in! 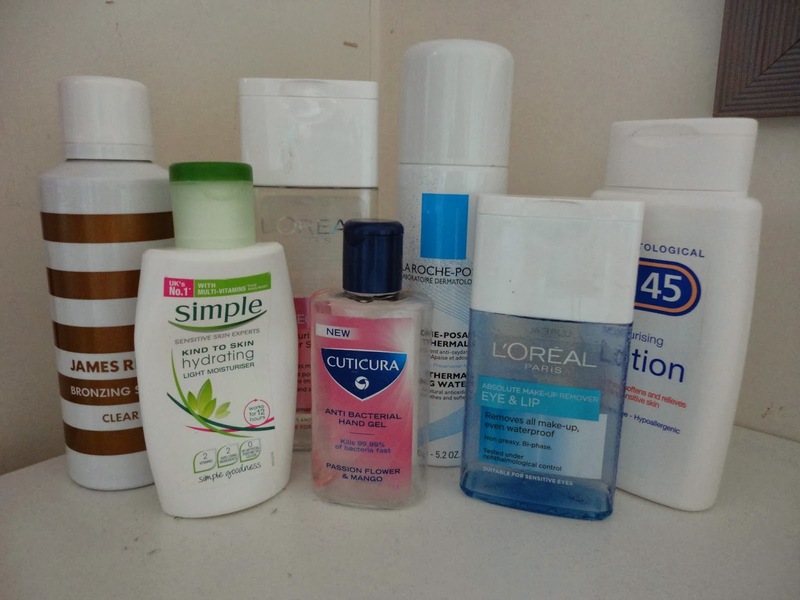 And that's it for my September empties! I feel like this was a super long post but I really wanted to talk as much as I could about the products, especially the ones I haven't reviewed before. Hope you enjoyed and happy October!